Home Education My child stuck what up his nose? What do I do now? My child stuck what up his nose? What do I do now? 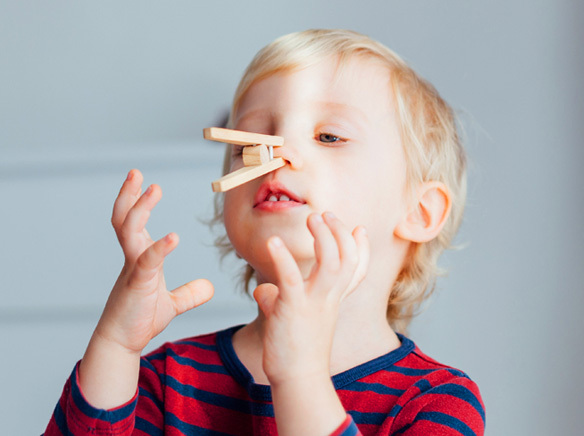 For toddlers, the act of stuffing objects up their nose helps them learn. But for parents, this common phenomenon seems more like a natural disaster. Can their child breathe? Does it hurt? Can it travel to their brain? Although objects in the nose are not an immediate problem, they can cause irritation or infection if they stick around. Batteries, including the alluring “button” variety, can cause damage to the lining of the nose. The results are even worse if the battery is ingested. They seem harmless, but magnets—in the nose, ears or intestines—pull toward each other and can cause damage.